Midgard Bestiary for 4th Edition #dnd out now! 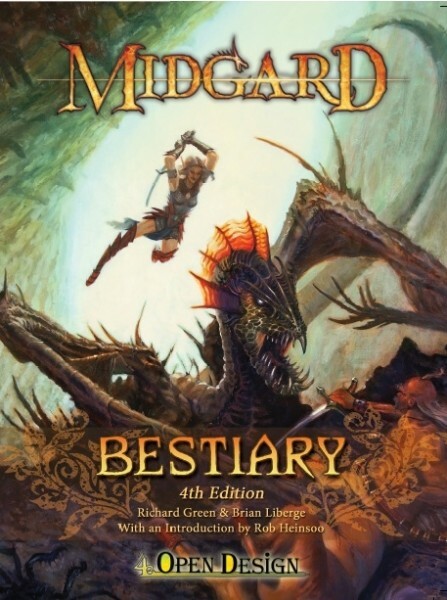 I'm very pleased to report that the Midgard Bestiary for 4th Edition Dungeons & Dragons that I co-wrote with Brian Liberge is out now at drivethrurpg.com! It's over a year since I started working on this book and I am very, very happy with how it has turned out. Kickstarter backers are being emailed their links by Wolfgang as I write this, but if you missed the Kickstarter, you can pick up the full colour PDF for just £6.16 ($9.99). Thanks to everyone who backed the Kickstarter, contributed to the discussions on the KQ forums or helped with playtesting. I hope you all like the book!